Heute machen wir weiter mit Interview von SADOSATO. Today we follow up to introduce you the bands that will be playing on Dark Munich Festival 2015 and present you Interview with Austrian Band SADOSATO. Reflections of Darkness [RoD]: How could you describe in general the music of SADOSATO? Are there any bands, who once influenced you and helped shaping your own style? 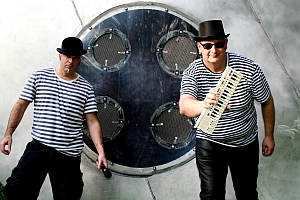 Sadosato: We often say, that our music style is in-between “No School-EBM” and Electro-trash, influenced by many, many bands in this genre and by many years of listening to electronic music. In addition, senseless, as well as funny lyrics or songs like ‘Fickificki’ but also we sing about important issues such as mental illness or racism. Attentive listeners often notice it only after the second time of listening, and then one recognizes the insanely profound statements and stories in songs such as ‘sexuell verwahrlost’, ‘Borderlinemädchen’ or electronic anti-racism anthem ‘Kongomädchen’. Thus behind SADOSATO there’s much more than it may seem at first due to our Punch and Judy show; similar outfits can be seen. RoD: One question about old school EBM. In your opinion, in which conditions is this genre now? Sadosato: Ha Ha…it is not dead yet! We think that, right now, some new, promising Old-school projects arise. We would say the genre shows firm signs of life again and again… and again.